In a wild affair that saw nine goals scored in the third period, #2 BU gave up a 3-1 lead, and came from behind twice to upend Massachusetts, 9-5, at Agganis Arena. The eventual game winner came off the stick of captain Matt Grzelcyk, 16 seconds into a power play. It was Grzelcyk’s first goal of the season and one of five power play goals for the Terriers. The other goal scorers were Ahti Oksanen with three, Jack Eichel and Brandon Hickey with two each and Danny O’Regan with his team-leading 17th. Senior assistant captain Evan Rodrigues didn’t score a goal, but assisted on six BU scores—despite sitting out five minutes with a major penalty—and was a force all night, as were Eichel and Grzelcyk. BU scored on six of nine power play chances, but yielded three to UMass on seven chances—with two goals coming on a five-minute major to Rodrigues. ►Three stars: #1 Rodrigues, #2 Oksanen, #3 Eichel. ►E-Rod tied BU’s school record of six assists in one game, which was previously set by Ron Anderson in 1971-72 and by Larry Davenport in 1967-68. In his last nine games, Rodrigues has four goals and 17 assists and, with nine goals and 25 assists for the season, he’s equaled the 34 points he scored as a sophomore. ►O’Regan's 17th goal ties Notre Dame’s Mario Lucia for most in Hockey East. Oksanen’s first career hat trick gives him 16, while Eichel is one behind him with 15. Eichel (photo) remains first in the conference in total points with 40, followed by Rodrigues (34) and O’Regan (29). ►BU improved to 16-4-4 overall and 11-2-2 in Hockey East, and it holds a four-point edge over BC with a game in hand. ►BU's six third-period goals tied a program record for most goals in a period. It was last done in this season's opener against UMass, an 8-1 win. ►The Terriers last put nine goals on the board in November 2007, drubbing Vermont at The Gut, 9-1. □ The Jack Eichel Show, starring Jack Eichel: Some of the best hockey he has played in a BU sweater. He ended up with 2 goals and 2 assists, but could have had at least 3 other goals. Some eye-popping individual moves. Was a going concern all night. □ Supporting cast with big offensive nights: Evan Rodrigues with 6 assists, Ahti Oksanen with his first career hat trick, and Brandon Hickey with 2 goals. □ The BU power play was clicking on all cylinders. Great passing and great effectiveness all night produced six goals. Reminded me a little of the BU teams in the early and mid-nineties. □ The team showed great resiliency after being down by a goal on two different occasions, and after giving up 2 goals on E-Rods five-minute major in the third period. There is no quit on this team, and they really are never out of a game -- even when down by multiple goals. □ And the negatives: 1) Too many defensive breakdowns. I am sure that Coach Quinn will have plenty to talk to his team about after the game in this regard. 2) Stop me if you have heard this one before: The team had too much undisciplined play and took way too many penalties (27 minutes), including the E-Rod five-minute major. 3) BU lost the physical game tonight against a tough UMass squad. This may be one of the team’s "Achilles Heels" (and stems largely from their youth). 4) The penalty kill units were not as effective as they have been in prior games. BU will need to clean up those areas if they hope to come out with a win against a strong Harvard squad on Monday afternoon. 2015 recruit Robert Carpenter assisted on two Sioux City goals in the Musketeers’ 5-3 win over Sioux Falls. Carpenter’s 19-23-42 scoring line puts him second in the USHL in points, one behind teammate Adam Johnson and one ahead of 2015 recruit Maxim Letunov. 2016 recruit Kieffer Bellows scored his team-leading 17th goal for the Stampede. For the second time in as many nights, Kevin Shattenkirk scored the shoot-out game-winner for the Blues. The former BU captain and All-American—and NHL all-star—snapped a wrist shot past Cam Ward to give St. Louis a 3-2 win against Carolina. Of Shattenkirk’s eight career shootout goals, seven have proven to be game winners. He's converted on seven of 15 attempts. Nick Bonino’s power play goal in the second period was the game-winner in Vancouver’s 5-2 victory over Buffalo. Bonino’s 11th goal of the season earned him the game’s first star. #7 Terriers visit Connecticut today looking to complete a sweep of the regular-season series. BU won the first game, 3-2, on Nov. 15. Puck drop is set for 3 p.m.
A Terrier win would bring a milestone for Coach Brian Durocher, who enters the game with a 199-111-40 record in his ten seasons behind the BU bench. #2 Terriers return home for their second meeting of the season against Massachusetts. The teams opened the regular season in Amherst with BU authoring a convincing 8-1 win. 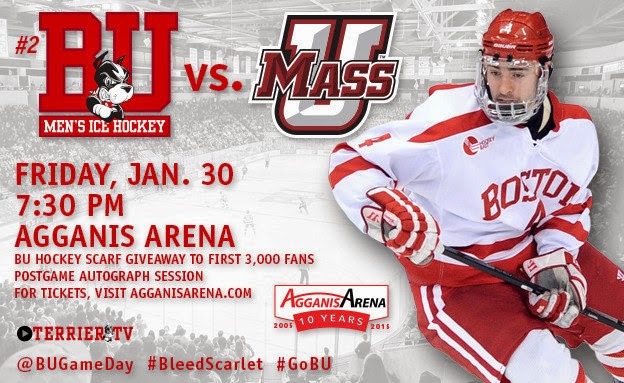 Puck drop tonight is 7:30 p.m. at Agganis Arena where the first 3,000 attendees will receive a Terrier scarf. An autograph session will follow the game. The Minutemen have been playing their best hockey in recent weeks with a 4-3-1 record in their last eight games. Sophomore Frank Vatrano leads the team in goals (13) and points (22), while freshman Dennis Kravchanko is second in scoring (21 points) and tops in assists (13). Freshman d-man Brandon Montour, who recently became eligible, has ten points in ten games. For BU, the top line of Jack Eichel, Danny O’Regan and Evan Rodrigues continues to produce. Rodrigues is on an eight-game point scoring streak (4G, 11A), Eichel is first in scoring in Hockey East—and second in the nation—with 36 points. O’Regan is tied for the conference lead in goals with 16. ► Tampa Bay’s Director of Player Development talked with NHL Radio (7:40 of audio) about Lightning draft picks including Terrier blueliner John MacLeod. Former Terrier captain and All-American Kevin Shattenkirk celebrated his 26th birthday by scoring the shoot-out game-winner (4:40 of video) in the Blues’ 5-4 win against Nashville. Shattenkirk also contributed an assist as did Colin Wilson for the Predators. The shootout goal came against a former Hockey East opponent, UMass Lowell product Carter Hutton. Former BU MVP Alex Chiasson scored his 8th goal of the season in Ottawa’s 6-3 loss to the Dallas Stars (his previous team). Episode16 of Inside BU Hockey features Bernie Corbett’s interviews with Coach David Quinn, senior assistant captain Evan Rodrigues (photo) and former Terrier blueliner and co-captain Ron DiVincenzo. Rodrigues, currently tied for second (with Danny O’Regan) in scoring among Hockey East players, was recently promoted to BU’s top line and has been the team’s hottest scorer over the past six weeks. Beginning with three assists in the RPI win last month, the Etobicoke, Ont., native has four goals and 11 assists in the last eight games. In last weekend’s overtime win at Vermont, he scored the game-tying goal and assisted on the game-winner. 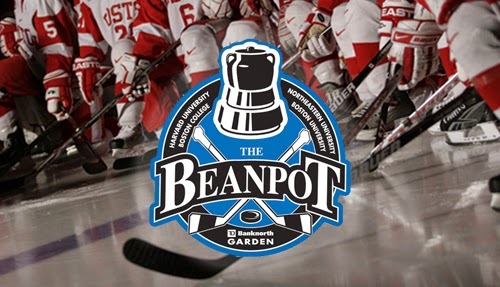 DiVincenzo, one of many Medford, Massachusetts skaters to play for BU, was a member of the Terriers’ first Beanpot champions in 1958 (wins over BC and Northeastern). In high school, he played for two-time All-American Jack Garrity. After graduation, he coached at Brookline High School, where his players would include future Terriers Gary Fay, Marc Hetnik and Bruce Milton. He was inducted into the Massachusetts State Hockey Coaches Association Hall of Fame in 1999. ► Stat Watch: Terriers go into week 19 of the season with the # 9 team offense (3.39 gpg), #4 team defense (2.00 gpg) and #5 (tied) power play (22.6%). There was no player on the ice with as much skill and craftiness as Harper, the AOF '98 forward committed to Boston University. His third period goal was a thing of beauty. He received a lead pass in the neutral zone, buzzed down the left side and cut into the middle, going in between and around several LC defenders. He held onto the puck as he cut to the right and backhanded a shot top shelf for the goal. Outside of his goal, his elite talent was on display throughout the game. He's got great speed, has an explosive initial burst and has quick feed. He does a good job of creating time and space for himself and his linemates. If there was a current Hockey East player to compare him to it would be Northeastern junior and Anaheim Ducks prospect Kevin Roy. 2017 recruit David Farrance scored a pair of goals, including the game-winner late in the third period as the Syracuse Stars beat the Jersey Hitmen, 3-2, in USPHL 16U action. Farrance, a left-shot defenseman, leads the Stars in scoring with a 22-20-42 line. Bleacherreport.com looks at some potential first round picks in June's NHL Entry Draft, including 2015 recruit Jordan Greenway. Chris Higgins and Colby Cohen, teammates on BU’s 2009 national championship team, combined for three goals for the EIHL Nottingham Panthers' in a 6-3 win over Braehead Clan. Higgins, who had recently returned from a knee injury, scored twice, while Cohen scored his second goal in as many games since rejoining the Panthers. 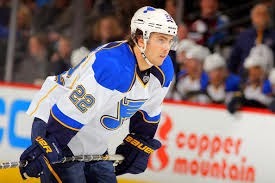 ► Cohen took time to wish his former Blueline partner, Kevin Shattenkirk, a happy 26th birthday with this instagram. Colin Wilson scored his 15th goal of the season as Nashville edged Colorado, 4-3 in overtime. The former BU All-American and Hobey Baker Award finalist is one goal shy of his career high and three points away from matching his career best. 2-1 win against Edmonton. For Coyle, who was named the game’s first star, the goal was his sixth of the season. 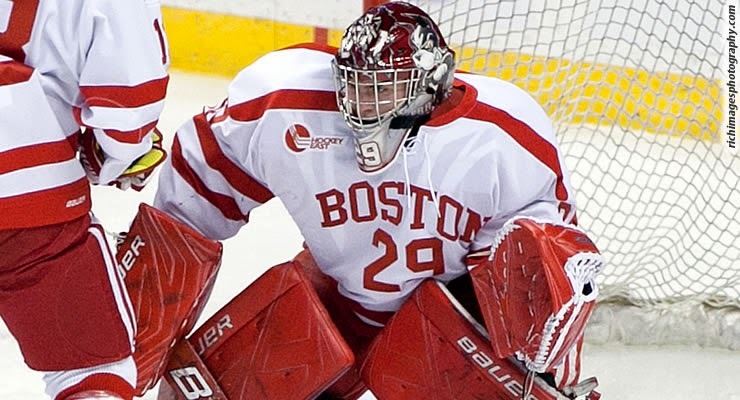 Terriers’ junior netminder Matt O’Connor was named Hockey East’s Defensive Player of the Week after limiting Vermont to three goals—only one at even strength—in BU’s sweep of the Catamounts. His save percentage for the two games was .955. O’Connor had earned the same honor back in October following wins against Michigan and Michigan State. Senior assistant captain Evan Rodrigues and freshman Jack Eichel were named to the weekly list of top performers. Rodrigues, who scored the game-winner and added an assist in Friday’s 4-2 win, tallied the game-tying goal on Saturday, assisted on the game-winner and executed a textbook hip check to stop a UVM rush. Eichel scored the final BU goal in both games: an empty-netter Friday and the game-winner on a deflection Saturday. Terriers moved up to the #2 ranking in both the USCHO weekly poll and the USA Today/USA Hockey Magazine weekly poll. BU is #3 in the SB Nation power rankings. ► BU Hockey historian Sean Pickett tweeted that Eichel’s overtime game-winner was the 100th overtime goal scored in program history. With his third extra-session goal of the season, Eichel is tied for the career lead among active Division 1 players. 2015 recruit Robert Carpenter recorded his first USHL hat trick and added two assists as Sioux City throttled Green Bay, 6-2. The previous night he had a goal and an assist as the Musketeers beat the Gamblers, 4-1. The seven-point weekend brought the former Austin Prep All-Scholastic forward to 40 points for the season in 37 games. He’s tied with fellow 2015 recruit Maxim Letunov for third in the USHL scoring race. Jakob Forsbacka-Karlsson, also a 2015 recruit, is a point behind at 39. For his efforts, Carpenter was named USHL Forward of the Week. Former Terrier captain and Hobey Baker Award winner Matt Gilroy, playing in the KHL for Atlant, made a splash at the league’s SuperSkills competition, breaking four targets on four shots in 4.78 seconds—setting a new record. Former Terrier standout Ryan Whitney, now playing with Sochi in the KHL, handled “5 Questions” from TheScore.com’s Justin Bourne, a former Alaska-Anchorage player. Whitney discusses playing in the Russian pro league and his plans for the future including finishing his degree at BU. Former Terrier captain and All-American Kevin Shattenkirk talked with ESPN about his first NHL All-Star weekend experience and was interviewed by Blues teammate Vladimir Tarasenko. Former BU All-American Colby Cohen talks about his recent return to the Nottingham Panthers, where his strong play earned “man-of-the-match” honors last weekend, being reunited with Terrier teammate Chris Higgins. Terriers rebounded from Saturday’s 2-0 defeat by Vermont to rout the Catamounts on Sunday, 9-2, in their biggest offensive outburst of the season. BU roared out to a 5-0 first period lead, a feat last achieved in October of 2008. Freshmen forwards Victoria Bach and Rebecca Leslie paced the offense with each contributing two goals and an assist. Other goal-scorers were Lillian Braga, Rebecca Russo, Samantha Sutherland, Diana Bennett and senior captain Marie-Philip Poulin, who produced a highlight-reel, end-to-end rush for BU’s eighth goal. Sophomore goalie Victoria Hanson played the first two periods and turned aside all 15 shots. Sophomore Mia Becker made her first college appearance in the third period and made nine saves, including stopping a penalty shot by the Catamounts’ top scorer. Hanson was named Hockey East’s Defensive Player of the Week. In addition to blanking Vermont for two periods, earlier in the week she backboned a 4-1 win over #3 Quinnipiac, stopping 21 of 22 shots. Poulin and Bach were named to the weekly top performers list. BU remains at #7 in the USCHO weekly poll. Polls and recognition--and a science experiment!